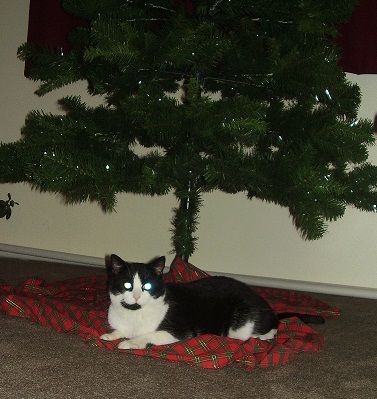 Sharpie, the Christmas tree coordinator. Last August, I was walking through Costco and was taken aback by the Christmas decorations that were already up in the store more than four months before the actual Holiday. I was too overwhelmed to snap a picture, but one of my Face Book friends who was in another Costco that same day did. He posted a picture of the display with one word, “NOOOOO!” I agreed; it was just too early to start thinking about Christmas. In my world, the weather needs to be at least below 90 degrees before the lights go up. Last week, I started reading the New Testament accounts of the events leading up the birth of Jesus. So many prophecies were fulfilled in the first few years of Jesus’ life; so many people were involved, whether they knew it or not and so much has happened since then. Over two thousand years later, hundreds of millions of people around the world still celebrate the birth of Jesus, whether they know it or not. Christmas has not been the same since then, because we all relax and enjoy the season. Whether the cards get sent out or not doesn’t matter so much. We keep in touch with our loved ones either way. If the decorations don’t make it up onto the house, it’s OK. That just makes it easier when January rolls around and everything has to be put away. If there aren’t tons of presents around the tree and our kids can’t make it home for Christmas, that is all right, too, because we love each other and understand that Christmas really is – all about Jesus! As we head into yet another holiday season, take time to enjoy the turning leaves, the smell of freshly cut pine trees, the Christmas carols and of course, the peppermint mochas. And take lots of time to quietly reflect on the greatest Gift of all. It is and will always be All About Jesus!